Click here to setup your pledges. 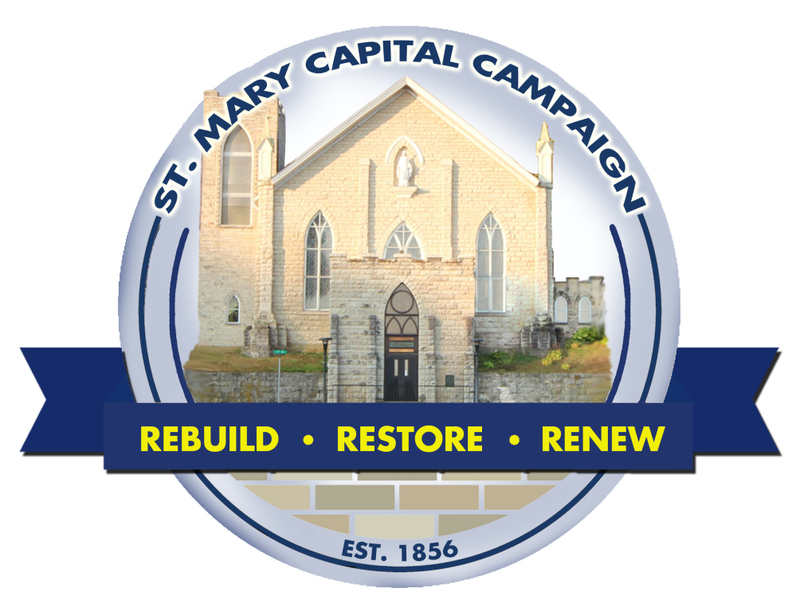 We are pleased to announce the launching of the Capital Campaign at St. Mary Catholic Church. The campaign has been titled “Rebuild, Restore, Renew” and is aimed to raise the funds required to repair and replace the aging facilities in our worship center and hall. Our financial goal is to raise $600,000 over a three year period. Our spiritual goal is to renew the community of the faithful. Time and Talent will also be needed to accomplish these goals. Through the prayerful, volunteer, and financial support of many we will succeed in our task and in doing so, help to make our Parish Family a stronger, more viable faith community. We invite all parishioners and visitors to support these efforts of renewal through their prayers and financial support. If we are united, we can make this campaign successful and exciting. Praying that God will rebuild, restore and renew those places in our lives and hearts that are wounded. He WILL do what He promised and we WILL emerge with an unshakable assurance of His goodness. We are currently in the preparation phase for the campaign, which is set to kick off in the spring 2018. One of the key steps in running a successful campaign is the recruitment of a strong leadership team. Our Campaign Committee members are Fr. Nils de Jesús Hernández, Joseph & Sharon Brooks, John & Mary Winter, Meaghan Schneider, Suzanne Pennington, James Whitney, Karol Nelson, and Cheri Moser (communications). These members have graciously agreed to serve in the committee. They will help to oversee the progress of the campaign, help with volunteer recruitment, and assist Fr. Nils in developing campaign strategies. It will take a parish effort to run a successful capital campaign. We will be looking for parishioners to serve as campaign volunteers. Remember that all hands united make a good project faster and efficient! All that we do is for the glory and praise of God! The Capital Campaign Committee met on Wednesday, October 25 to discuss the plans for the campaign. The target date is to start in the upcoming spring of 2018. The Finance Council identified several needs that need to be addressed. Yet, we do not have a final amount of the cost as we are still in the planning process. We request your prayers and considerations to be open to this important endeavor. Remember that all hands united make a good project faster and efficient! All that we do is for the glory and praise of God! The core committee is going to meet at the end of October to discuss the plan for the campaign. The target date is to start in the upcoming spring of 2018. We have identified several needs that cannot be addressed individually; without the help of a campaign. The following needs to be addressed in order to refurbish the church building: new roof, insulation of the ceiling, painting of the inside walls and redecorating with stencils, new carpet, electrical lighting update, electrical handicap accessibility to the church, evaluation of the bell system, etc. The parish hall needs a new energy efficient furnace and AC. All hands united make a good project faster and efficient! All that we do is for the glory and praise of God! We are pleased to announce a very special capital campaign at St. Mary Parish in the upcoming spring of 2018. We have identified several needs that cannot be addressed individually; without the help of a campaign. We know that St. Mary church is a beautiful building that stands out to visitors who tour through downtown McGregor. We feel it is important to maintain that beauty and at the same time enhance the worship space where we gather to build up the kingdom of God. We know how proud our parishioners are to have this jewel that speaks volumes about the catholic presence in Northeast Iowa and the commitment of many generations to maintain our buildings. The following needs to be addressed in order to refurbish the church building: new roof, insulation of the ceiling, painting of the inside walls and redecorating with stencils, new carpet, electrical lighting update, electrical handicap accessibility to the church, evaluation of the bell system, etc. The parish hall needs a new energy efficient furnace and AC. We would like to form a committee so that we can start planning for this major capital campaign. If interested in serving in this committee, please contact Fr. Nils. We would like to have an initial meeting in October. All hands united make a good project faster and efficient! All that we do is for the glory and praise of God!